With Sergei and Yulia Skripal still in critical condition, here's a look at some of the unanswered questions that British officials are chasing. WHERE DID THE NERVE AGENT ORIGINATE? 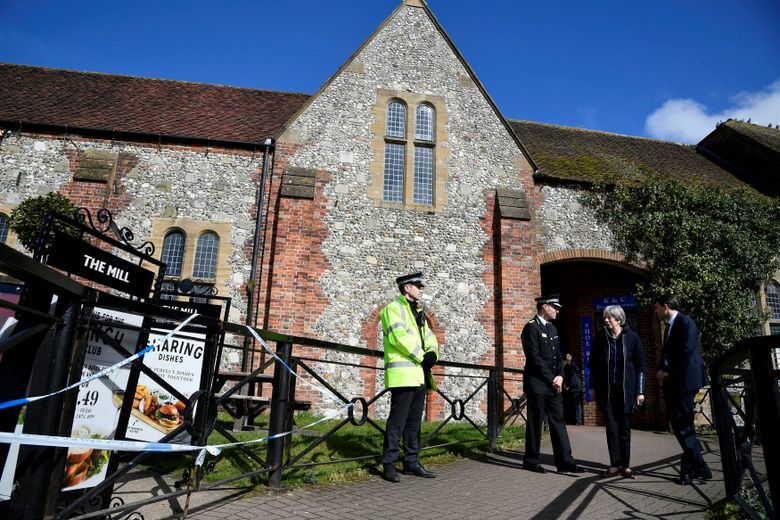 British Prime Minister Theresa May has declared that former Russian military intelligence officer Sergei Skripal and his daughter Yulia were poisoned March 4 in Salisbury with Novichok, a class of military-grade nerve agents developed by the Soviet Union at the end of the Cold War. They are both in critical condition. Hamish de Bretton-Gordon, an ex-commander of the British Army’s chemical, biological, radiation and nuclear regiment, said Novichok was only ever manufactured at one site, a military laboratory at Shikhany in central Russia. De Bretton-Gordon said there were rumors of a Novichok test in Uzbekistan in the 1980s but that any of the remaining nerve agent from that experiment would have lost its toxicity — and that the agent used to poison the Skripals was extremely toxic. He said it was “very unlikely” the Novichok used in Salisbury could have been lost or stolen in the years after the Soviet Union collapsed in 1991. Russia’s envoy at the international chemical weapons watchdog said Britain and the U.S. both had access to Novichok and that the nerve agent used to attack the Skripals could have come from either of their stockpiles. According to the Organization for the Prohibition of Chemical Weapons, there is no record of Novichok nerve agents having been declared by any nation that signed the Chemical Weapons convention. HOW DID NOVICHOK ARRIVE IN BRITAIN? It’s unclear. Some British media, citing unnamed police sources, are reporting that Yulia Skripal unknowingly brought the Novichok nerve agent to Salisbury in her suitcase on a plane trip from Moscow, arriving in Britain the day before the attack. Some scientists say it’s feasible that the nerve agent could be made stable enough to travel and that various compounds could have been added to Novichok to make it a clear, colorless liquid resembling water, perfume or alcohol. The ingredients to make Novichok are relatively cheap and accessible, but mixing them together is extremely dangerous, which suggests the nerve agent was brought to the U.K. as a finished product. “The moment you mix this stuff up, it presents a high risk to you — and if you were to spill it, you’d be in terrible danger,” said Andrea Sella, a professor of inorganic chemistry at University College London. De Bretton-Gordon said it was possible that the Novichok arrived in Salisbury in Yulia Skripal’s suitcase, but said much could go wrong in such a scenario. “I think there must be somebody behind it who has delivered it,” he said. HOW WERE THE SKRIPALS EXPOSED TO THE NERVE AGENT? It’s thought the Skripals were exposed to Novichok at the elder Skripal’s home in Salisbury. But officials are struggling to explain why there appears to have been a significant delay between when they were exposed to the deadly agent and when they got sick. Yulia Skripal arrived in the U.K. on March 3 but it was not until the following day — after she and her father had eaten lunch and stopped at a pub — that they were found slumped over unconscious on a public bench. A police officer who then visited the Skripal residence was also later hospitalized for chemical poisoning. As of Friday he was still in serious condition. “The fact that both the father and daughter came down with very similar symptoms at a similar time suggests that the contact with Novichok was fairly close for both of them,” said Alastair Hay, a professor emeritus of environmental toxicology at the University of Leeds. Sella said it seemed unusual that neither of the Skripals appeared to have noticed their exposure to Novichok since they did not seek medical attention. Jill Lawless in London and Michael Corder in The Hague contributed to this report.